She was speaking today at the end of a leaders’ summit in Salzburg. EUROPEAN COUNCIL PRESIDENT President Donald Tusk said today that there would not be a Withdrawal Agreement without a backstop for the Irish border, reaffirming support for Ireland in wake of reports. He was speaking as European leaders – including Taoiseach Leo Varadkar – were meeting in Salzburg, Austria, to discuss Brexit and the Irish border issue. The Brexit ‘backstop’ for the Irish border is still without agreement after months of to-ing and fro-ing between the EU and the UK negotiating teams. Without it, there will be no Withdrawal agreement and the UK will go crashing out of the EU in March – which will most likely lead to a border reemerging on the island of Ireland. But shortly after Tusk spoke, British Prime Minister Theresa May claimed that the only workable proposal for an Irish backstop was the one put forward by the UK. This suggests including the entire UK in the backstop deal, which was proposed for Northern Ireland alone, and delaying a withdrawal from the single market and the customs union until technology is invented to carry out checks without building a hard border that would affect the frictionless trade and the movement of people. “I’m negotiating hard in the interest of the British people, to deliver on what the British people voted on, and to stick to commitment we made… but we also need to ensure there is no hard border between Northern Ireland and Ireland. Yes there are concerns that have been made by the EU, and I’d like to know what those concerns are. She then took aim at the EU’s proposal for a backstop, which proposes customs checks on goods travelling between Great Britain and the island of Ireland. There’s no counter proposal that delivers a good deal: that respects both the integrity of the United Kingdom and respects the vote of the British people. 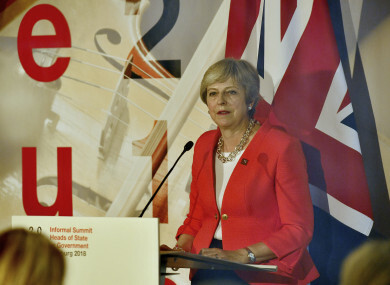 She added that there would not be a second EU referendum, and that it was essential to deliver a deal for all the people of the UK – including those in Northern Ireland – and if that deal wasn’t possible, then there would be no deal. Meanwhile, answering questions from reporters this morning, Coveney said that he believed it was likely that a final deal would be done, and that the EU negotiating team were working to “de-dramatise” the proposed regulatory alignment on the island of Ireland. He said that Barnier believed that they were 85% agreed on the final Brexit deal, but Coveney said that the remaining 15% “involves Irish issues” – and that the most difficult of these is the Irish backstop. “Commitments were already made last December, and committed to again in March in writing [to an Irish backstop]. This is the business end of negotiations, it was always going to be difficult to conclude negotiations. It will take an intensification on the detail of how the backstop works to get a deal – that hasn’t happened to the extent that we need it to. He said that work was ongoing to make the regulatory alignment on the island of Ireland (or a border along the Irish Sea) to “de-dramatise minimal amount of practical checks” so that the backstop is more palatable for the UK negotiating team. “I do believe that the Prime Minister is genuine in her commitment to a backstop,” Coveney said. That’s where we cannot be flexible, on a hard border reemerging on the island of Ireland. However, Sinn Féin President Mary Lou McDonald accused May of “playing a game of chicken with Irish interests”. “Once again the British Government turned up to an EU Summit meeting with no workable solutions to their Brexit problem and no care for Irish interests, our rights, our agreements and our economy. “Theresa May is engaged in a dangerous game of brinkmanship. This week’s summit has been marked by bad faith from the British Government and disregard for deadlines. She said that with less than six months to go to the Brexit deadline, “the Irish Government and the EU must remain resolute in the face of British arrogance”. The EU must remain true to their word that without the agreed legally enforceable backstop there will be no withdrawal agreement. Britain will not be allowed to walk away from their obligations or fudge the issue of Ireland. This morning, the Taoiseach met with UK Prime Minister Theresa May at Salzburg for a 40-minute meeting before the informal summit. “I had a very good meeting with Prime Minister May and her team. Time is running short there are proposals for another summit in October and then November. Ireland wants to avoid a no-deal scenario but we are preparing for that. We’re preparing for extra staff and officials, updated IT systems so we’re ready for that eventuality should it occur. “We have a border already in the sense that there’s a political border and a different currency is used in Northern Ireland, so a political border does exist. “But what we want to avoid is new barriers to trade, new barriers to the movement of people. Think of all the people who cross the border every day to work or study, think of all the businesses that trade across the border. What we’re trying to do is to engineer a new way which is very similar to what we have now, but that’s difficult. It was expected that there would be a final Brexit deal to vote on at the current summit in Salzburg, but because of outstanding issues, it’s expected that there will be another summit organised for mid-November. There’s more on the Brexit timeline, as it stands now, here. Email “Theresa May: Only workable proposal for an Irish backstop is the UK's proposal”. Feedback on “Theresa May: Only workable proposal for an Irish backstop is the UK's proposal”.